St. Croix, Indiana - A few words etched on a sign hanging in front of Phil and Joann Etienne's family-run timber business say a lot about their philosophy: "Harvesting our grandparents' management... Managing our grandchildren's harvest." The message reflects the long production cycle of timber harvesting. Trees grow slowly and sturdy oaks cared for by one generation often aren't ready for harvest until a generation or two later. It's the same for timber harvesters like the Etiennes. The trees they process into lumber will eventually be finished into furniture, flooring, pallets, and even mulch for homeowners' landscaping. Like the owners of forestland, they pass on added value. In the end, the consumer benefits. "It's a long journey from the tree to the showroom," Joann says. "Most people don't understand all the steps along the way." The Etiennes have committed themselves to educating others about the world of wood, from advocating sustainable forestry practices on the land to the efficient processing of logs transported to their St. Croix milling operation. 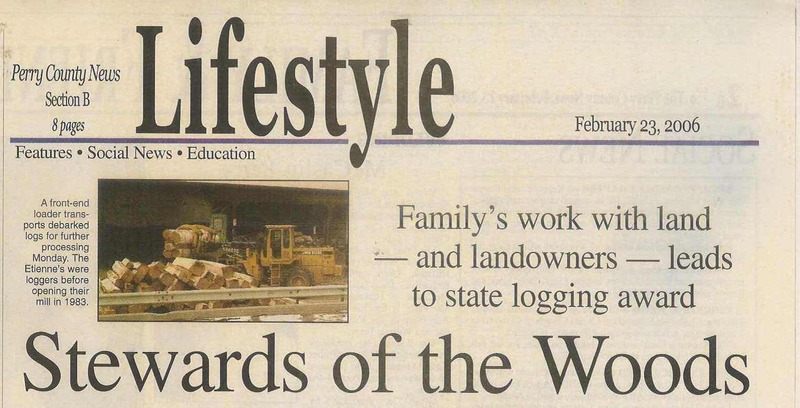 Citing the company's care of the land - and their work with landowners - Phil Etienne's Timber Harvest was presented the 2005 Indiana Logger of the Year Award Feb. 1. 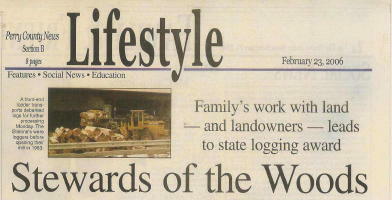 The annual honor is presented by Indiana Tree Farm Committee and the Indiana Hardwood Lumbermen's Association. "It's a real honor to be recognized by your peers," said Cindy Emmons, Phil and Joann's daughter and one of several family members involved in the multifaceted business with roots more than 30 years old. 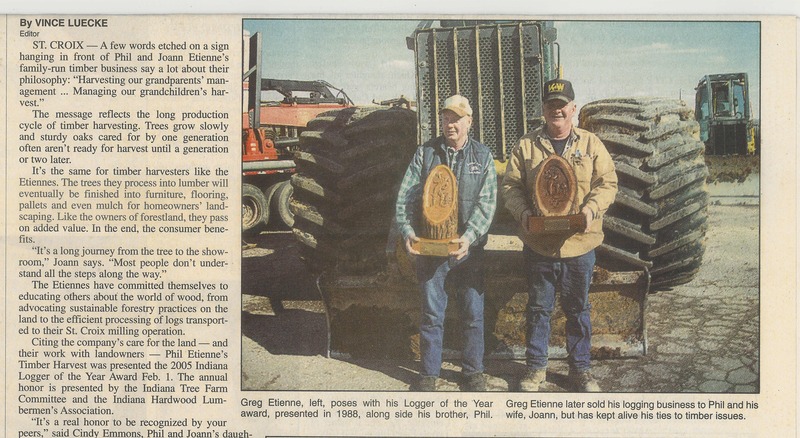 The Etiennes have been active as loggers since the 1970s and began their mill operation in 1983. They've since modernized to meet changing market conditions and in 2001 created Bear Hollow Mulch and later, Bear Hollow Woodcarvers along Indiana 37. 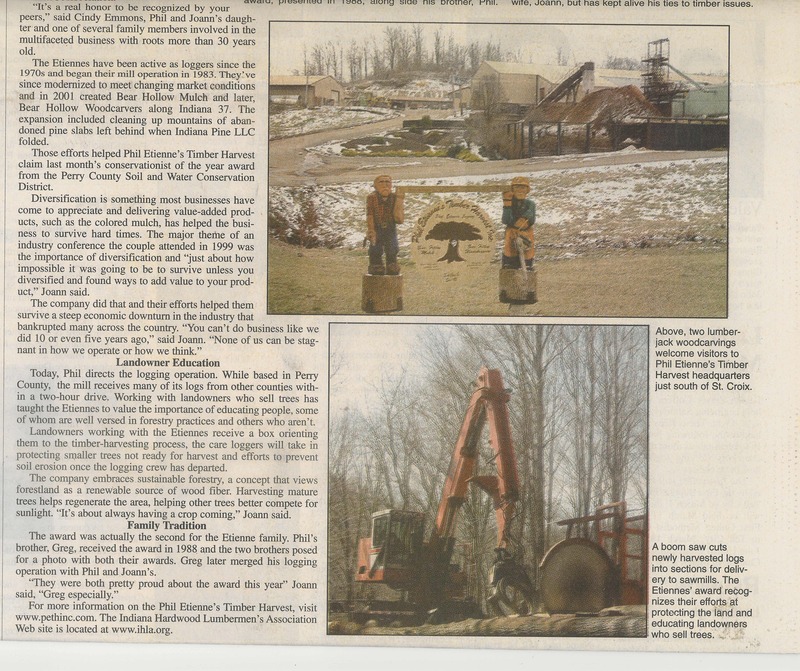 The expansion included cleaning up mountains of abandoned pine slabs left behind when Indiana Pine LLC folded. Those efforts helped Phil Etienne's Timber Harvest claim last month's conservationist of the year award from the Perry County Soil and Water Conservation District.. Diversification is something most businesses have come to appreciate and delivering value-added products, such as the colored mulch, has helped the business to survive hard times. The major theme of an industry conference the couple attended in 1999 was the importance of diversification and "just about how impossible it was going to be to survive unless you diversified and found ways to add value to your product," Joann said. The company did that and their efforts helped them survive a steep economic downturn in the industry that bankrupted many across the country. "You can't do business like we did 10 or even five years ago," said Joann. "None of us can be stagnant in how we operate or how we think." Today, Phil directs the logging operation. While based in Perry County, the mill receives many of its logs from other counties within a two-hour drive. Working with landowners who sell trees has taught the Etiennes to value the importance of educating people, some of whom are well versed in forestry practices and others who aren't. Landowners working with the Etiennes receive a box orienting them to the timber-harvesting process, the care loggers will take in protecting small trees not ready for harvest and efforts to prevent soil erosion once the logging crew has departed. 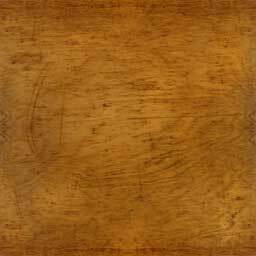 The company embraces sustainable forestry, a concept that views forestland as a renewable source of wood fiber. Harvesting mature trees helps regenerate the area, helping other trees better compete for sunlight. "It's about always having a crop coming," Joann said. The award was actually the second for the Etienne family. Phil's brother, Greg, received the award in 1988 and the two brothers posed for a photo with both their awards. Greg later merged his logging operation with Phil and Joann's. "They were both pretty proud about the award this year" Joann said, "Greg especially." 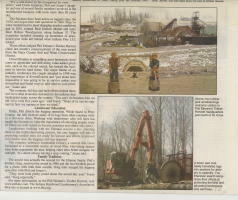 For more information on Phil Etienne's Timber Harvest, visit www.bearhollowindiana.com. The Indiana Hardwood Lumbermen's Association website is located at www.ihla.org.